A call or a put on a portfolio/basket of underlying assets with a specified composition and weighting scheme. The underlying asset can be a basket of commodities, securities, or currencies. Can be cash settled or physically settled – cash settlement is more common. 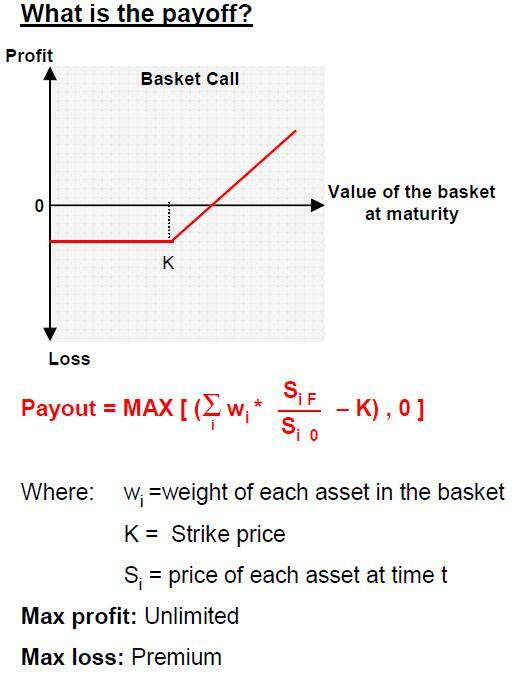 Multinational corporations use basket options to hedge against foreign exchange rate risk. Also, investors who wish to have a broad exposure to a particular region or want to have protection against an adverse move in a relevant benchmark index buy basket options. An alternative to a basket option is an index option. However, if an investor is seeking exposure to an obscure economic sector or to an emerging country market, then none of the indices that underlie listed index options is likely to be sufficiently correlated with the portfolio of interest. Thus there will be significant tracking error risk that can cost more than the additional cost of the basket option. A second alternative is a collection of individual stock options. This alternative may be expensive due to transaction costs and because the implied volatility of each option includes a large component of specific stock risk. An option on a portfolio of assets is cheaper than an option on each constituent of the portfolio.The lower the correlation between the various assets that make up the basket, the greater the cost saving. It is often traded OTC, and thus can be customized to suit the needs of the client. A wide range of baskets are available – for eg. interest rate, FX, equity or commodity related. 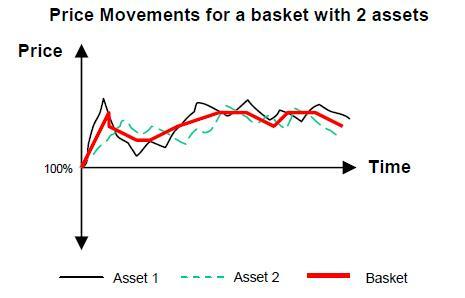 Baskets allow for a balanced exposure and are less volatile with respect to an index. Hey very nice blog!! Man .. Beautiful .. Amazing .. I’ll bookmark your blog and take the feeds additionally?